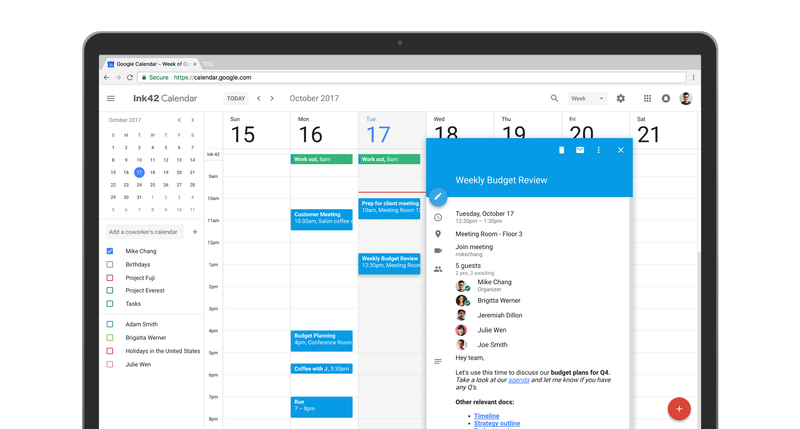 After a few years of sticking with essentially the same design, Google Calendar on the web is getting a makeover today. That means a fresh new color palette and a design in line with Google’s Material Design scheme, but also — and more importantly — a responsive layout that smartly adjusts your calendar to the size of your browser window. This update isn’t just about giving Calendar a fresh coat of paint, there are also a number of feature updates here that’ll make using the service a bit easier. If you work in a large company, then Calendar can now show you more details about your organization’s meeting rooms, for example (where it is, what AV equipment is there, etc. ), after your admins put this info into the system. Google Calendar invites can now also include rich formatting and links to relevant spreadsheets, documents and presentations. Ideally, this means you have all the info you need for a productive meeting (as if there were such a thing…) in one place. Another new feature is the side-by-side “Day” view that allows you to view and manage calendars in separate columns without having to scroll. I don’t think that’s something most users will ever need, but Google argues that it’s great for employees who manage multiple calendars, including administrative assistants, to schedule meetings for the whole team. In addition to these marquee updates, the new Google Calendar also features the ability to see more information about meeting participants when you hover over a calendar invite and an easier way to share a calendar with a group. You also now get the option to view and restore deleted items in case you accidentally delete that invite to the one meeting that would actually have been productive. Starting today, G Suite admins can enable these new features and individual users can click the “Use new Calendar” link in the upper righthand corner of the Calendar view to get started (or you could just click here — which is even easier).